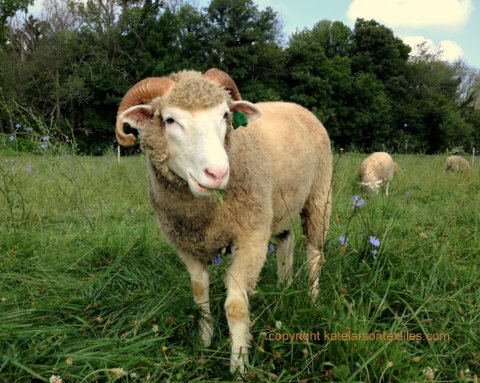 Border Leicester sheep are wonderful grazers, becoming ever more proficient as they mature. At first glance, they may appear to nibble the forages indiscriminately, but they are actually feeling the plants with their lips and selecting what they want to eat. This isn’t as obvious when they are out on lush pasture where everything is tasty, but is easier to see when they are on rougher forage. I love to watch (and hear) them carefully select and munch at speed. Though it’s hard to hear in this video, there is a lip-smacking noise that the sheep often make as part of the selecting process. Listening to thirty sheep making this little pop, pop, pop noise all at once is impressive! In this video is little Vina at three months, followed by Joan, a professional grazer if I ever saw one! 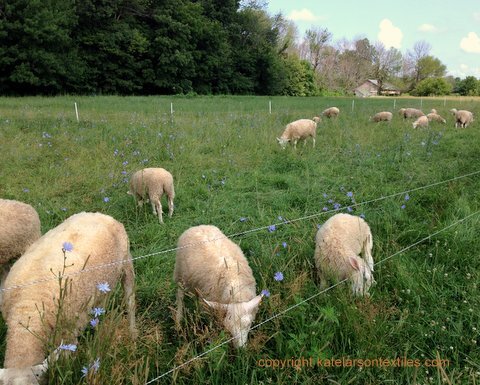 They are in the back corner of a pasture that is over-mature (as happens when haymaking is late due to a wet spring/summer), so there are plenty of weeds, which the farmer regrets, but the sheep eat them with relish. Those of you in my local knitting and spinning classes will have probably heard tales of Joan’s noble ferocity and gallant nature. She’s also a bit piggy. Vina is her granddaughter. I am using portable fencing to create small paddocks within the pasture. You can see the movable posts on the far side of the paddock. Each day, the sheep get a new strip of grass, because as we all know, grass is greener on the other side. This keeps them moving forward and reduces the area that they regraze. A yearling Horned Dorset hanging out with the Leicesters. 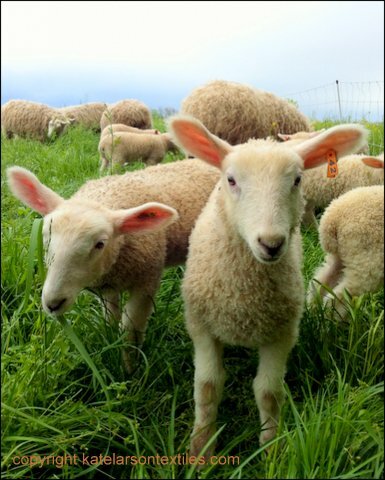 Here they are at about six-weeks old, learning to graze and follow the group to pasture. Great post! I got a little visit to your farm without leaving the house! So happy to “see” you here you here at the farm. 🙂 I hope we can meet up in October! They all look so clean!! Luckily, they are clean right now. Thanks, Elaine!